Team Sahlen will kick off their 2017 race season at Watkins Glen International. 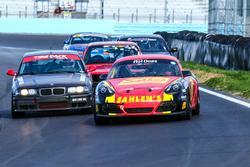 The event will be the “Sahlen’s Sports Car Springfest at the Glen” with the American Endurance Racing series. Team Sahlen entered the event in 2016. The race saw Team Sahlen secure a 1st place finish overall in Saturday’s 9 race. Then in Sunday’s race, Team Sahlen finished just off the top step on the podium, finishing 20 seconds out of the lead after 9 hours of racing. For this weekend’s race, Team Sahlen will be entering all three of Porsche Caymans in the Top Overall Group 5 premier class for the fastest cars in the series. This class has become very competitive with several fast teams and cars entering the race for overall honors. Some of the makes include BMW, Corvette, Audi, and Ford Mustang. It will be no easy task for Team Sahlen in this event. The last time Team Sahlen was on track was at the 2016 American Endurance Racing season finale at Mid-Ohio Sports Car Course. Team Sahlen faced some fierce competition at this event. On both days of racing, Team Sahlen secured 2nd place overall.